WASHINGTON, D.C. — The Break Free movement swept Washington, D.C. over the weekend, over 1,300 activists gathered outside the White House on Sunday to demand an end to fossil fuels. 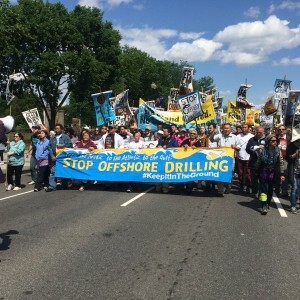 Led by frontline community members, people marched in Washington, D.C., to call on President Barack Obama to end all offshore drilling. Outside the White House, in Lafayette square, we heard from speakers from the climate frontlines in the Gulf of Mexico, Arctic, and Atlantic. These are the people facing the most dire threat from climate change and experiencing the impacts most directly right now. A young Alaskan activist, Essau Sinnok, testified about the loss of his uncle, who was killed when he fell through ice that was unusually thin and weak due to climate change. Sinnok was followed by youth leaders, the generation that will inherit a climate crisis if we don’t act. Rev. Lennox Yearwood asked the crowd what will this world look like in 2060, when the kids behind him on the stage were older. Next we heard testimony from Gulf Coast leaders, including A representative of the Houma nation who have lost land, culture and cultural identity to rising seas made worse by climate change, and sinking land made worse by oil and gas canals. And then we were on the march. We took over the streets of D.C., singing and chanting, waving flags and banners, we made our way from the White House to the Lincoln Memorial overlooking the Reflecting Pool. Once there, we gathered around a stage in front of the Lincoln Memorial and heard from other frontline climate activists.